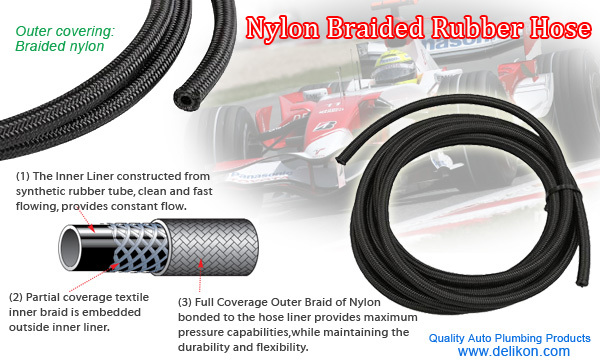 Nylon Braided Rubber Hose for Racing Cars - Light Weight ! High Performance ! DELIKON High Performance Braided Racing Hose offers unsurpassed levels of performance and reliability for your tough performance applications. A professional performance Stainless Steel Braided Hose for high speed racing. Your best choice! This Nylon braided rubber hose is constructed of a tough, abrasion-resistant Nylon sheathing, bonded to the textile inner braid embedded in the synthetic rubber liner. This gives the hose incredible flexibility, while maintaining the ability to withstand high vacuum and pressure. It can withstand a maximum pressure rating of 350 psi. The Nylon braided rubber hose can take the most demanding conditions and still deliver you to the winner's circle. inner liner. (3) Full Coverage Outer Braid of Nylon bonded to the hose liner provides maximum pressure capabilities, while maintaining the durability and flexibility.